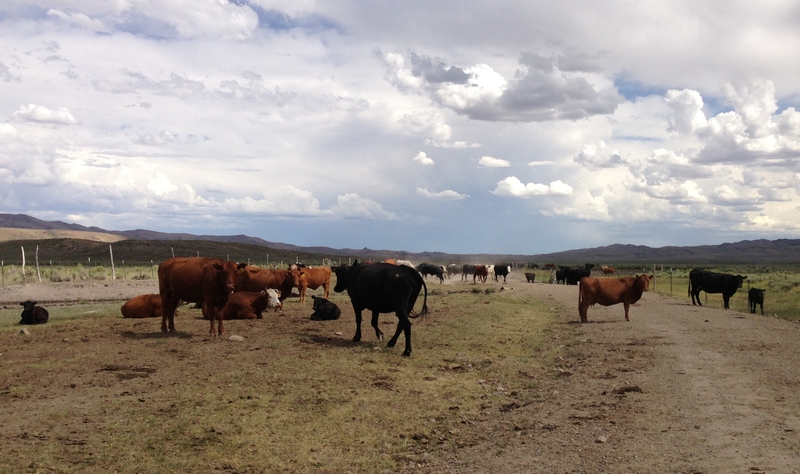 Cattle need special care in times of drought. Water quality — Water is the most critical factor in the diet of food animals. When cattle don't drink enough clean and safe water every day, feed intake and productivity declines. Drought conditions can potentially affect all sources of water, including groundwater, but surface waters are especially vulnerable. It is important to frequently monitor water quality, especially as quantity becomes more limited, and test for basic water quality parameters such as total dissolved solids, sodium, sulfates, and nitrates/nitrites. Blooms of blue-green algae in water are also an issue. These cyanobacteria can produce toxins that can affect the liver and nervous system. Depending on the specific toxin and amount ingested, animals may die suddenly, or suffer from weakness, staggering, or photosensitization. Feed quality and nutritional deficiencies — Drought conditions frequently result in the need to feed poor quality forages or to switch to alternative feed sources. Both can affect animal nutrition and increase the risk for intoxications. Use of poor quality forages can cause or exacerbate deficiencies of important minerals such as selenium, copper, and phosphorus and vitamins such as vitamins A and E. In addition, drought affected forages are often deficient in energy and protein. Even in non-drought years, deficiencies in selenium and copper are common in California cattle, particularly beef cattle. 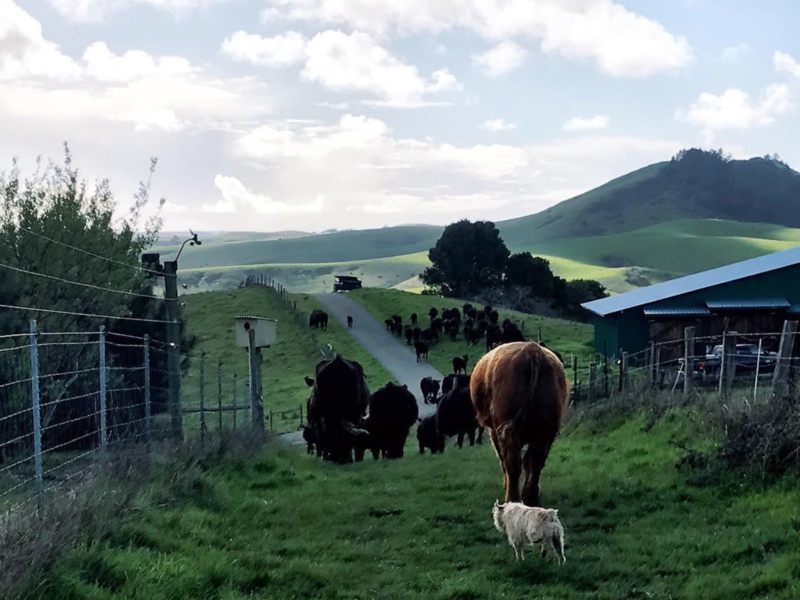 Copper deficiency causes reduced production, diarrhea, decreased resistance to infectious agents and parasites, poor vaccine response, loss of bone strength in calves, weakness and wobbling in neonates, reproductive failure, and sudden death of adult animals. Selenium deficiency also results in less resistance to infectious agents and parasites, and causes white muscle disease of skeletal and heart muscle resulting in stiff gaits, slow movement, heart damage and weak neonates. Primary vitamin A deficiency occurs in beef cattle on dry range pasture during periods of drought. Clinical signs include night blindness, dry eye, retarded growth rate, reproductive failures, and increased mortality. Maternal deficiency of vitamin A can cause abortions, stillbirths, or calves born alive but blind and weak that die within 1 to 3 days. Cows should be given an injection of vitamin A (and D) about 30 days prior to calving and calves should be given a vitamin A injection at birth. 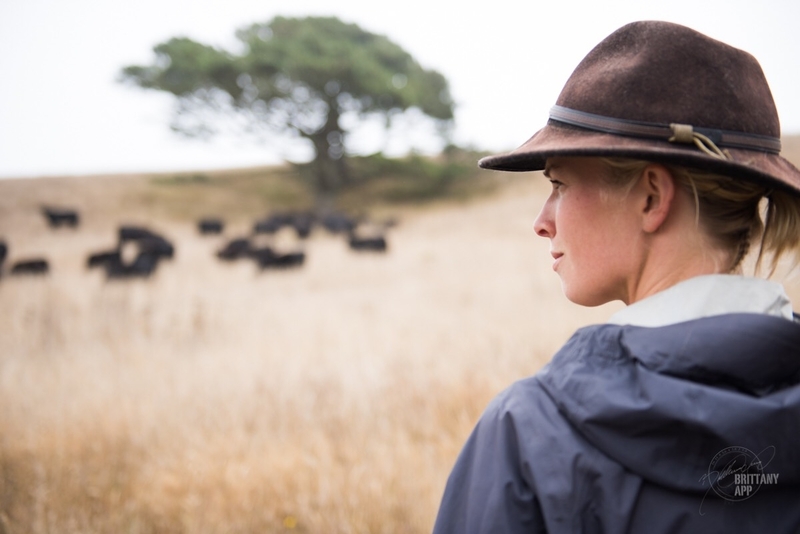 Increased incidence of plant poisonings — Cattle will seek out and consume plants that they would not otherwise find palatable during drought conditions. Nitrate poisoning is one of the most common plant associated intoxications diagnosed by the California Animal Health and Food Safety Laboratory. The potential for nitrate poisoning to occur is increased when livestock water sources also contain elevated concentrations. The first sign of nitrate poisoning is often the sudden and unexplained deaths of one or more animals. Other clinical signs include drowsiness, weakness, muscle tremors, increased heart and respiratory rates, staggering, and recumbency. Signs can develop with several hours of ingesting a toxic amount. Nitrate concentrations can be easily and cheaply determined from samples submitted to a veterinary diagnostic laboratory for testing. During periods of drought, cattle producers should be especially careful about the quality of feed and water available for their animals. Sick animals should be tested for various nutritional deficiencies and dead animals can undergo necropsies to determine cause of death so that other animals in the herd can be treated appropriately. Additional information and testing is available at the California Animal Health and Food Safety Laboratory System. For laboratory location and contact info, visit www.cahfs.ucdavis.edu. A longer, more detailed version of these tips may be found here. 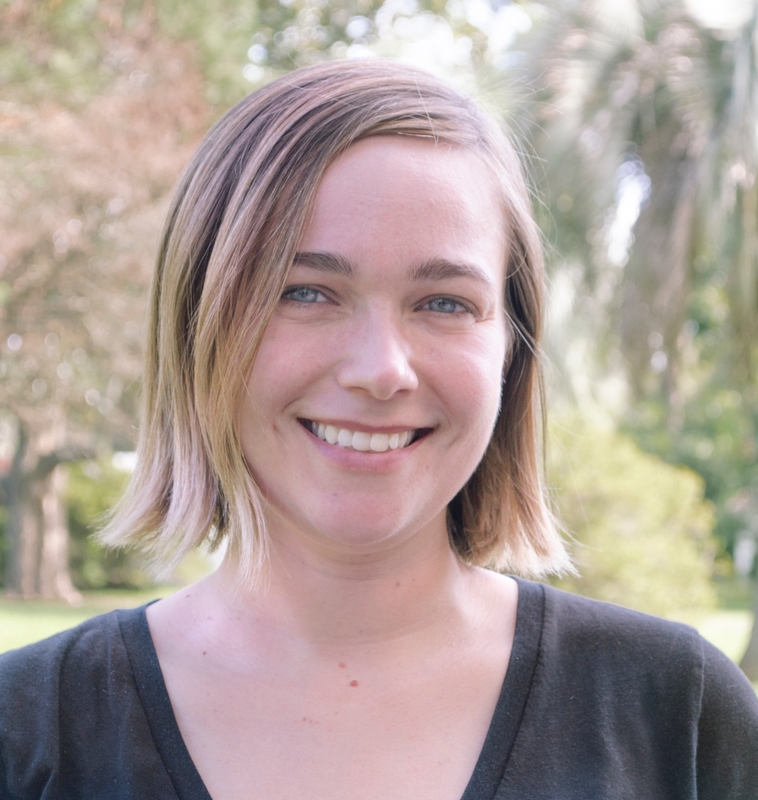 Robert H. Poppenga and Birgit Puschner, veterinary toxicologists with the California Animal Health and Food Safety Laboratory System at UC Davis School of Veterinary Medicine, contributed to this article. Help the California Department of Fish and Wildlife celebrate their first annual California Invasive Species Action Week, Aug. 2 – 10, and protect California's diverse landscapes. Hundreds of invasive plants and animals have already established themselves in California's landscapes and populations are quickly expanding each year. 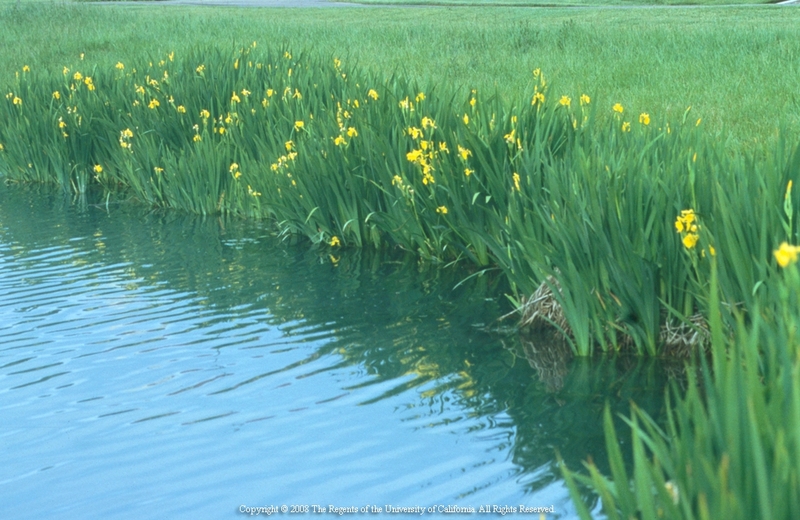 Invasive species are organisms that are not native to an environment. Once they are introduced, they establish themselves quickly and spread - causing harm to the environment. Invasive species threaten our waters, native plants, animals, agriculture, economy and popular recreational sites. 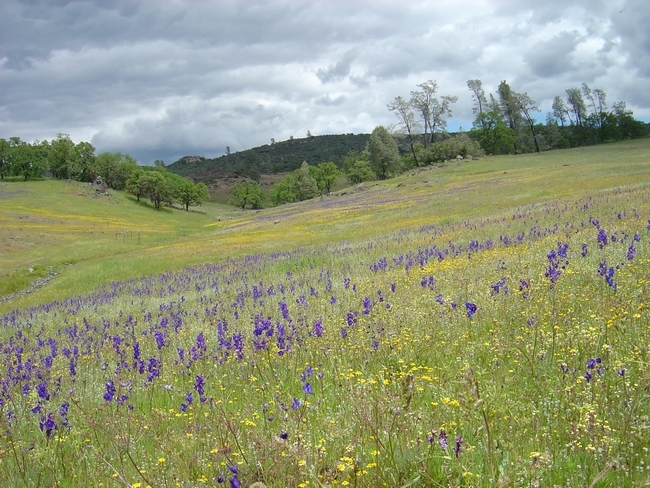 Prevention is the most effective strategy to manage invasive species in California. Action Week is dedicated to increasing public awareness and inspiring action by residents of California. Find out which species are threats to California from the Invasive Species Council of California. Learn about California's invasive plants from the California Invasive Plants Council. Select native or non-invasive plants for your home's landscape. Use only certified “weed-free” forage, hay, seed, mulch, soil, and gravel. Eat them. Yes, really. Check out these interesting websites to find out who is edible and how to prepare them, Invasivore.org, EatTheWeeds.com, and EatTheInvaders.org. Volunteer for invasive species removal/habitat restoration projects. The California Department of Fish and Wildlife are hosting events across the state to spread the word about invasive species for Action Week. Visit their schedule of events to find an event and location near you! 2014 California Invasive Species Action Week poster. California consumers may not “know beans about beans,” but they should. Dry beans are a big business in California. In 2011, growers harvested 45,000 acres of dry beans valued at $58 million. Lima beans accounted for about 40 percent of this total acreage, with California producing nearly 99 percent of the U.S. domestic supply of dry lima beans. Why should we be so interested in beans? From a nutritional standpoint, dry beans are a healthy food choice - an excellent source of protein, fiber, vitamins and minerals, plus they’re very low in fat. Organizations such as the American Heart Association, the American Diabetes Association and the USDA’s My Plate all recommend including beans in one’s diet to reduce cholesterol, maintain normal blood sugar and to maintain a healthy weight. The California Dry Bean Advisory Board posts many bean recipes on their website at http://calbeans.org/. From a production standpoint, beans are a crucial crop for farmers. California growers produce four main classes of dry beans, including limas (large and baby), common beans (such as kidneys, pinks, whites, cranberries and blacks), garbanzos (chickpeas), and cowpeas (blackeye beans). Garbanzo beans are grown as a winter crop, while the others are produced in the summer. California’s dry beans are marketed throughout the world, including Japan, Mexico, Canada, and the United Kingdom. California also grows dry bean seed stock for export to other states and international markets. In rotation with other crops beans help control weeds, add biomass to the soil via plant matter disked into the ground after harvest, and require relatively few pesticides. In addition, beans, as legumes, fix nitrogen from the air via nitrogen-fixing bacteria that colonize the roots, forming nodules. Cowpeas, for example, fix about 100 pounds of nitrogen per acre, providing most of the nitrogen needs for this crop. Likewise, garbanzo beans require minimal nitrogen inputs for crop production. 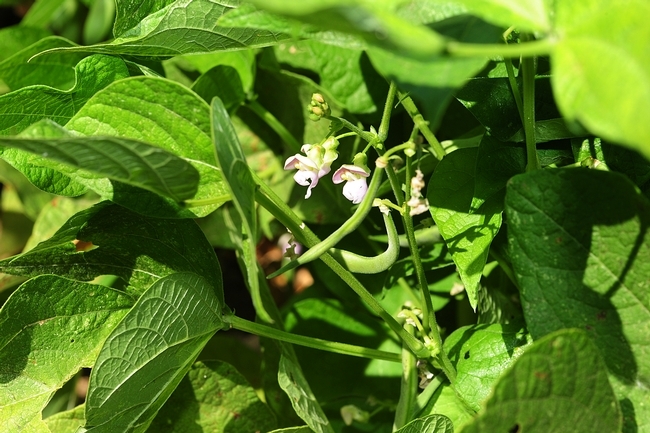 Economically, beans can enhance the annual farm profitability because common beans and cowpeas can be double-cropped with grains or forage crops, producing two crops in one year. 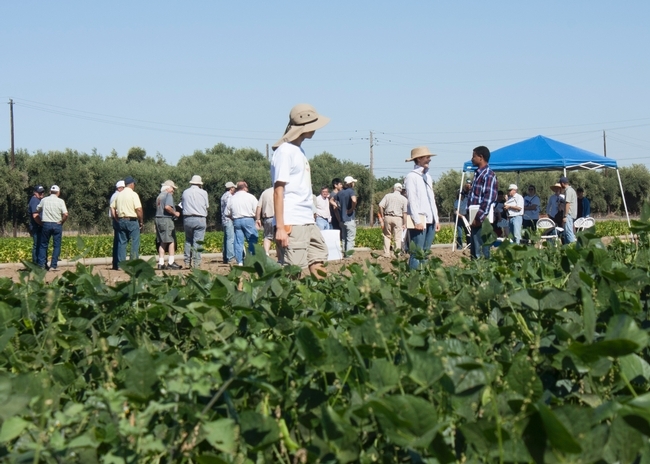 University of California scientists showcased their dry bean research advancements at the annual UC Dry Bean Field Day, held Sept. 5 at the UC Davis agronomy farm. The event drew more than 50 growers, industry representatives, students, faculty members and UC Cooperative Extension farm advisors. 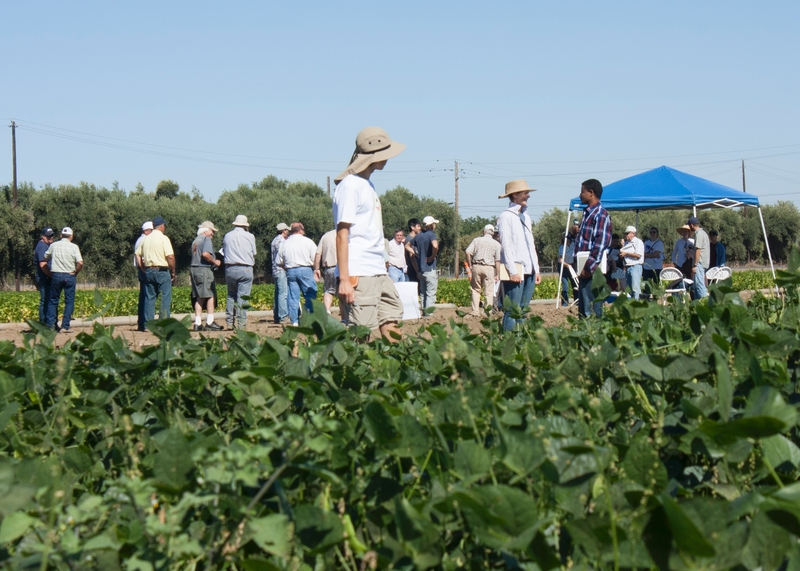 The participants learned about UC research trials, led by Paul Gepts, professor in the Department of Plant Sciences at UC Davis, focus on dry bean breeding programs for pest and disease resistance, drought tolerance, organic production, and yield and quality increases. “Dry” refers to allowing the beans to fully mature and dry on the plants, as opposed to picking the beans green as a fresh market vegetable. 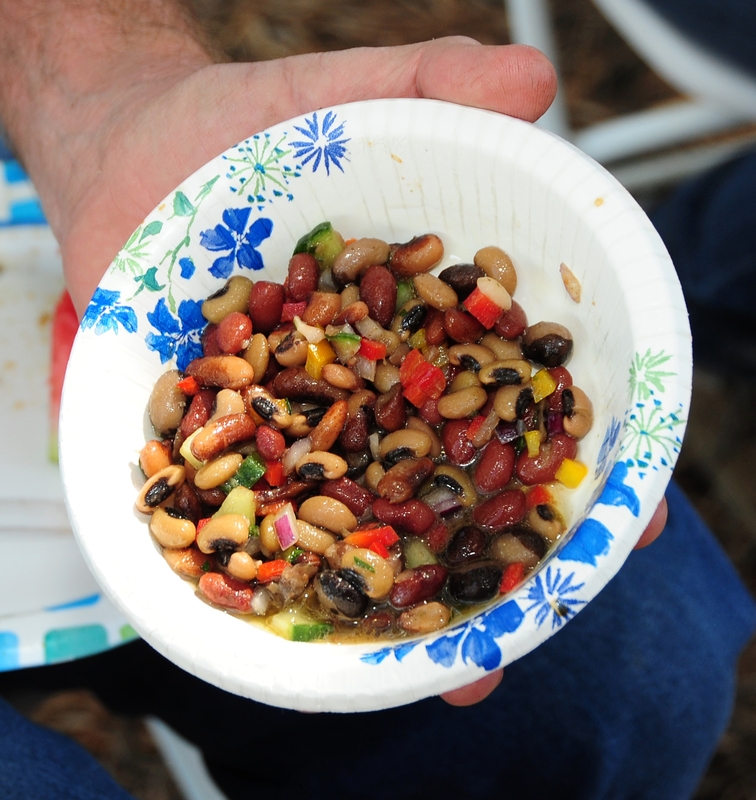 Many of today’s commercially grown dry beans come from University of California varieties, such as those shown at the UC Field Day. Seed germplasm for different genetic traits are selected from all over the world. 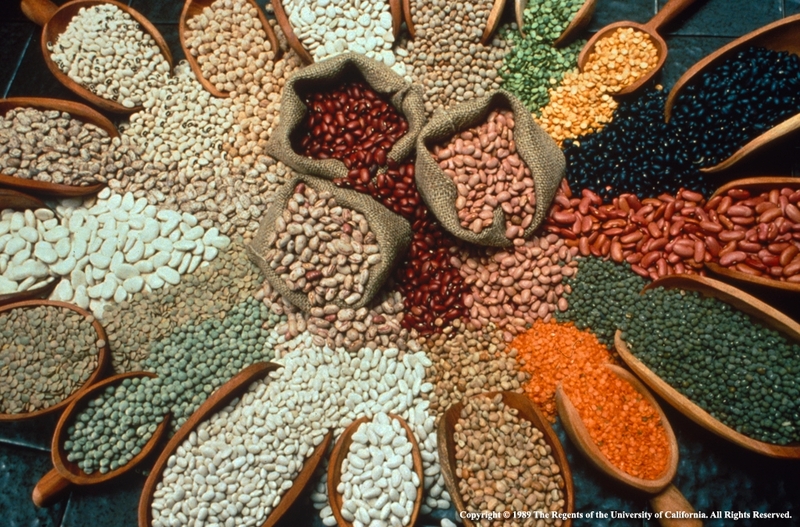 The lima bean trial at UC Davis included 56 seed selection entries, the heirloom beans included 25 entries, and cranberries and pink beans had 134 entries. Earlier this year eight advanced line garbanzo entries were tested. UC Davis researchers work with hybrids produced by hand crosses to increase seed yield, quality, pest and disease resistance and plant vigor. They receive funding from a variety of sources including the California Dry Bean Advisory Board and USDA. As shown from this field day, UC research is leading the way to ensuring that the future of California’s dry bean industry remains strong. These efforts will continue to enhance sustainable farming practices in our state and provide nutritional benefits to consumers. The bottom line is that beans are good for you. 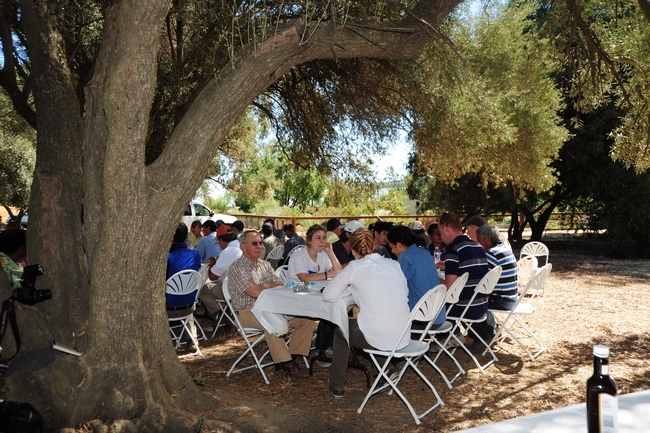 A special treat at the UC Davis Field Day luncheon, served at picnic tables shaded by olive trees on Bee Biology Road, was a locally produced three-bean salad. It vanished within minutes. “Excellent!” the attendees raved. So, the next time you’re in the produce section of your favorite grocery store, enjoy some California-grown beans. From the field to fork, these beans are the best of the best. Blackeye bean production in California, UC ANR publication number 21518. Common bean production in California, UC ANR publication 8402.